Are you 16 or younger? Do you consistently kill it on the hill? If you answered, &quot;yes&quot; to these questions, then we have something for you! The 2007-2008 Little Slammer Series at Waterville Valley, New Hampshire on December 1st, December 30th and January 26th! Here is the deal...This year we have two categories The Big Slam and The Little Slam. First off, The Little Slam, totally free, open to all and a great way to get into competition, not to mention a great way to win some rad product. The weekly winners will receive everything from hoodies to DVD's. After all is said and done the overall point winner from the 3 events will win brand new skis! Not bad for a free comp! Oh I forgot to mention we have product from Fuel TV, Salomon Skis and Oakley. 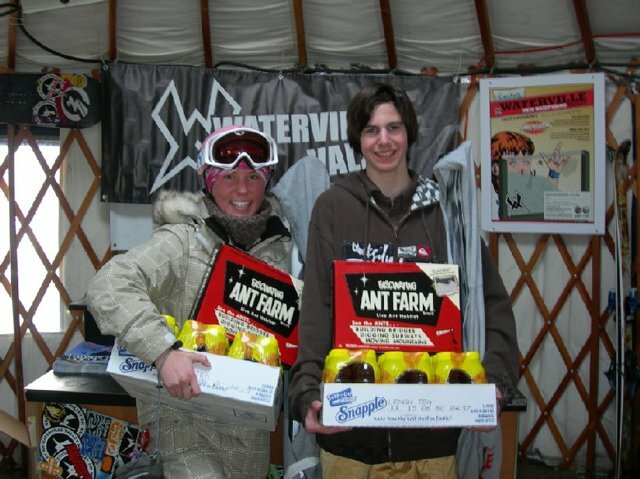 2007 Big Slam winners and Waterville Team riders: L: Tiffany Davenport R: PJ BeauregardThe main event however will be the Big Slam. Registration will be $5 and it will be open to all. Just like the Little Slam, the weekly winners will walk away with even better prizes from goggles to skis, but the real kicker it the overall winner. At the end of the series when all the points are calculated and measured, the overall winner will receive a one-year sponsorship from Waterville Valley for the 2008-2009 season. This will include a free season pass, a bio on snowboardwaterville.com, free entry into all 2007-2008 WV events plus all the insider gear like sweatshirts, t-shirts, and stickers. Registration will be from 8am-10am in the Events Yurt.